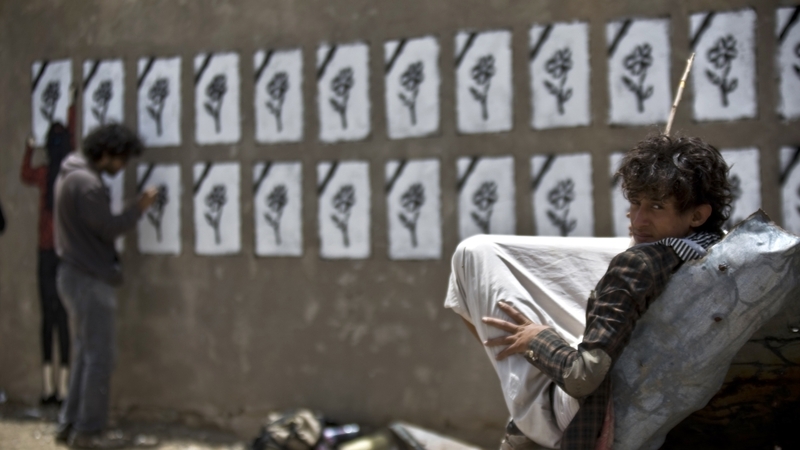 In Yemen, Murad Subay’s bold murals commemorate the human cost of war. Not many street artists welcome an audience. 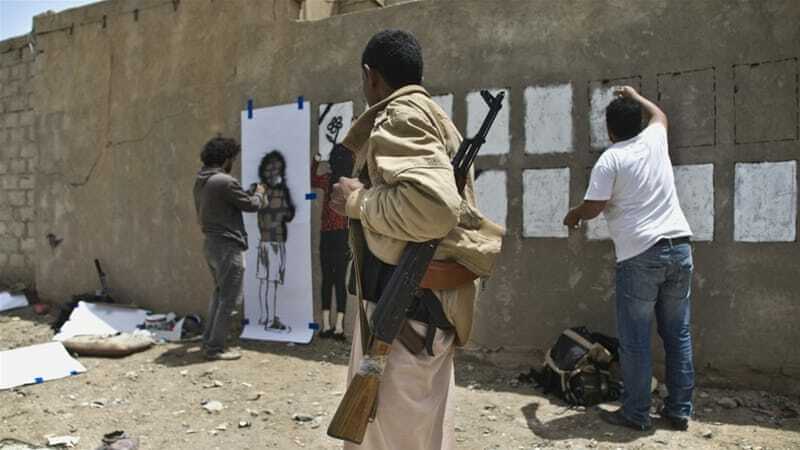 But Yemeni painter Murad Subay, 27, doesn’t like to work in the dark. His murals – and their bold proclamations of colour – serve as public gathering points, where strangers come to watch Subay paint while offering comments, critiques, and bottles of juice or water. Whether the murals bear criticism or colourful celebration, they are never done in secret. For Subay, that is exactly the point. For over four years, the young artist has used five different art campaigns to construct public spaces where people can denounce social ills and express the community’s frustrations. 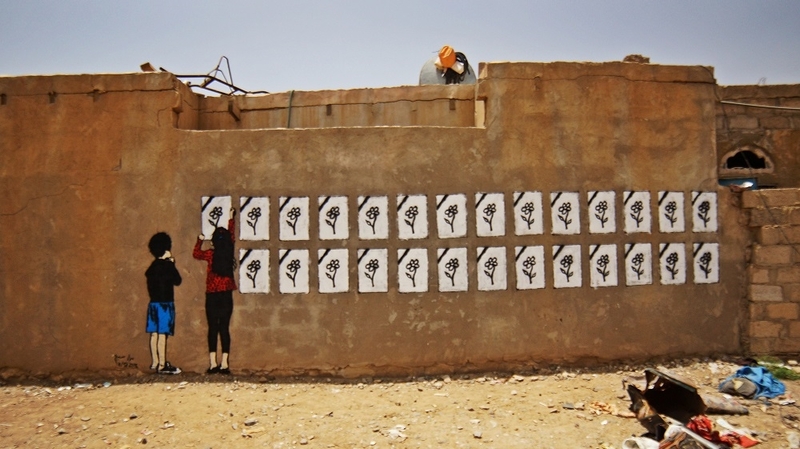 In his latest campaign, “Ruins”, each mural serves as both art and remembrance; done in tandem with fellow artist Thi Yazen, the project commemorates the civilian deaths of the ongoing violence in Yemen, where the WHO estimates 2,800 have died since March. While focus may now be on the country’s politics and the recent failure of the Geneva conference, Subay embarked on Ruins in order to call attention to the worsening humanitarian crisis in Yemen. 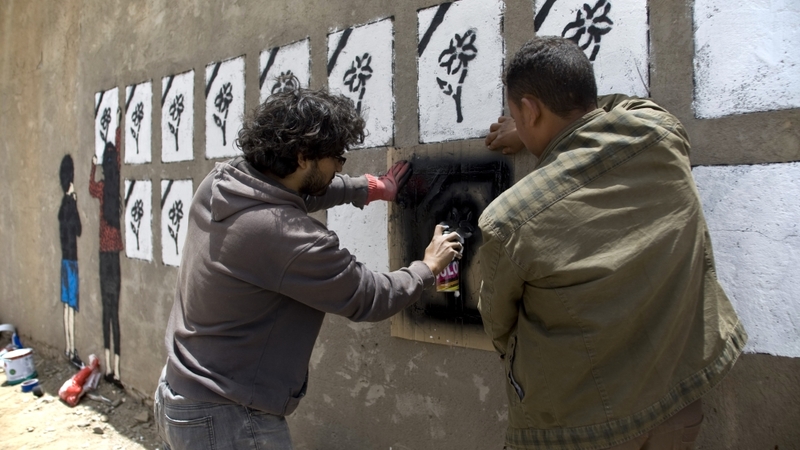 To do so, he has taken his tools to the most damaged areas in Sanaa, erecting murals amid the destruction of air strikes in order to “paint” tribute to the conflict’s human cost. Al Jazeera: You began ‘Ruins’ to commemorate the civilians that have died during the conflict in Yemen. Can you speak a bit more about the vision behind this project? Murad Subay: My goal was to highlight the direct suffering of people in Yemen, and also to express everyday people’s concerns about this war while commemorating the victims of the violence. I’m against war in general, and I’m not with any [political] party. The one thing I care about, and the thing all people in Yemen care about, is that the war stop. I first launched the campaign on May 18, in Beni Hawat. I painted a mural in that area, where civilians were killed, many of them children. You’ll see in the mural that there are black lines on the flowers – when a person dies in our country, we place black lines over their photo to signify that they’ve died. This is what I did on the mural to commemorate the victims, to remember them. You’ll notice flowers with one leaf, and flowers with two leaves. The ones with two leaves symbolise the adult victims, and the flowers with one leaf commemorate the child victims. We’re trying to do our best. Our work is humble, I know that, but we try to highlight the damage on the civilians, the children, the elderly, the people who are most affected by the war. This war is not the people’s struggle. The people’s struggle is just to find something to eat, something to drink, and something to provide shelter. 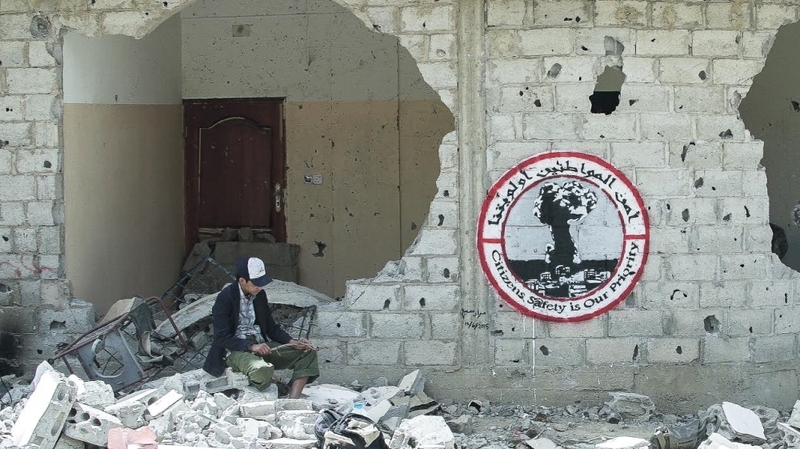 Al Jazeera: Some media outlets have nicknamed you ‘the Banksy of Yemen’, but your murals have an important social element that involves the larger community in a way that Banksy’s work does not. Where does this motivation come from, and how do you go about involving others? Subay: I first began painting after the 2011 uprising in Yemen with the campaign ‘Colour these Walls’, when we painted murals in what was called the ‘red lines’ between the zones of fighting factions. At the time, I’d wanted to do something, and was hoping that painting would cheer me up and cheer others up as well. It was a kind of commiserating through colours and art. Others came to colour the walls with us. Now, involving people in our campaigns has become important for different reasons. Our campaigns have begun to address some political and social issues, so input and direction from people are very important. It means their voices, and ours, will be heard. It helps show different perspectives and views, and also keeps attention focused on these issues, because people feel they can make a difference when they walk by their own work on the streets. Al Jazeera: What types of social issues does your art aim to tackle? Subay: We continued the [Colour the Streets] campaign for three months, since mid March 2012 to mid June. Our second campaign, ‘Make the Walls Remember These Faces’, aimed to remind us of the people who disappeared in Yemen since the late 1960s – kidnapped. We continued it for seven months. I also have been working on making sculptures, but had to put this project on hold due to the war. I was only able to make one installation in the street. And then I stopped because there’s no electricity, there are no resources. Al Jazeera: At a time when prices are high, food and water supplies are scarce, and it’s estimated that 15 million people are in dire need of health services, what role can art occupy? How must art be reconciled with people’s desires to fulfil other pressing relief needs? Subay: Art is another way to highlight our concerns as people, and to send messages to local people and to the global audience about what’s happening in Yemen. When people see a mural, they are reminded every time that there were killings there. Yes, there are a lot of things we need, like water and food, but the presence of art is also very important. We have to find other options [to express ourselves] while in a state of war. We have to talk, we have to argue, we have to find ways to a middle ground. Continuous fighting will not do anything. I’m doing my best as an artist. What can I do? Take up arms and go to the street? No. I’d rather paint. That’s what I can do. Posted in All PostsTagged Aljazeera about yemen, graffiti in yemen, yemen, Zoe HuBookmark the permalink. Photos by: Yahya Arhab (EPA), about the activity of “Ruins” campaign, “Faj Attan” area, 13 June 2015.